Shop Audio-Technica ATR288W TwinMic VHF Wireless Video Camera Mic System from AMS with 0% Interest Payment Plans and Free Shipping. The Audio-Technica TwinMic VHF Handheld System is a multi-purpose wireless system that provides versatile performance for camcorders, karaoke, DJs, houses of worship, schools, meetings and presentations. 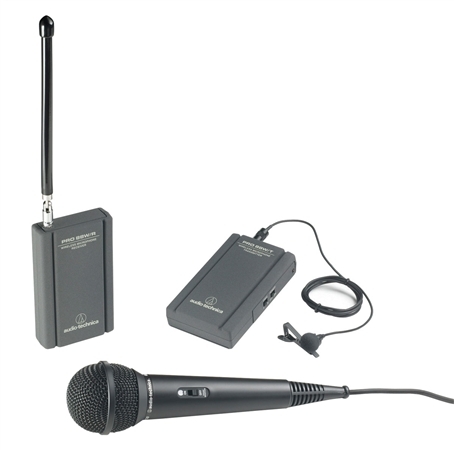 The ATR288W TwinMic VHF wireless system is supplied with two microphones, the ATR35 omnidirectional condenser lavalier microphone and the ATR20 unidirectional dynamic vocal/instrument microphone.